1. Remove the steering column upper and lower covers (see page 20-181). 2. Disconnect the 6P connector (A). 3. Check for continuity between terminals No. 1 and No. вЂў There should be continuity with the key in the ignition switch. вЂў There should be no continuity with the key removed. 4. 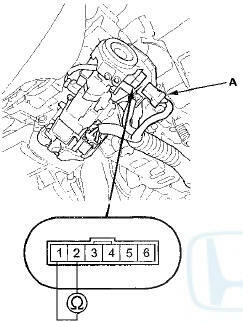 If the continuity is not as specified, the ignition key switch is faulty; replace the steering lock assembly (see page 17-16).